Alonissos passenger and car ferry ticket prices, timetables, ticket reservations and information for ferries sailing from Alonissos to Agios Constantinos, Glossa, Skiathos and Volos. Compare all available Alonissos ferry ticket prices in real time and book the cheapest available Alonissos car and passenger ferry tickets sailing to and from Alonissos, Agios Constantinos, Glossa, Skiathos and Volos with Hellenic Seaways ferries online with instant confirmation. Book Alonissos Ferry Tickets with Hellenic Seaways for ferries sailing from Alonissos to Agios Constantinos, Glossa, Skiathos and Volos online in advance to enjoy the cheapest available ferry ticket price. The price you see is the price you pay. There are no hidden extras or surprises such as added fuel surcharges or booking fees and we do not charge you anything extra for paying with a Visa Electron card. The price we quote you for your selected Alonissos passenger or car ferry ticket, onboard accommodation and vehicle type is all you will pay, and that's a promise. To obtain a Alonissos ferry ticket price and book your ferry ticket securely online please use the real time ferry booking form on the left. You are also able to add a hotel at your destination, or anywhere else, to your ferry ticket when completing your ferry ticket reservation. ALONISSOS Greece is one of the less visited holiday islands of the Sporades chain that lies off mainland Greece's east coast. Unlike its noisy neighbour Skiathos, Alonissos has a tranquil, soporific atmosphere with lots of old-world Greek holiday charm. Alonissos island may have escaped the ugly embrace of the package tour industry but there are still signs of change as more visitors discover its many attractions. Hotels and apartments have sprung up in the main port of Patitiri and newly resurfaced roads have made access to Alonissos beaches much easier than they once were. The surrounding waters are a marine park and, Alonissos can boast some of the cleanest swimming in the Mediterranean. There are boat trips to several of the outlying islets, although visiting is restricted in order to protect endangered seal habitats. Alonissos is a favourite both with independent travellers and with visitors here on all inclusive Greece holidays. The most remote of the Sporades group of islands, Alonissos is much quieter than it's neighbours, Skiathos and Skopelos. As there is no airport on Alonissos, the easiest way to get here is by flying into Skiathos and from there taking a ferry to the island. The port village of Patitiri with its sprinkling of bars and tavernas is home for the majority of the islanders, and also where most of the tourists stay.The village was created after an earthquake badly damaged the islands then main town of Palaia Alonissos which sits on a cliff above Patitiri. In the harbour, boats can be found that will take you for day trips to neighbouring islands, and to some of the coves and beaches around the island. Palaia Alonissos, seen here from Patitiri, was abandoned when its inhabitants were forced to leave after the earthquake in 1965. There still remains the ruins of a fifteenth century Venetian kastro, and a small chapel with an unusual fish-scale style roof. Today, many of the houses have been restored, and are used as holiday homes, so preserving many of the towns original features. Votsi, is the second most popular area for tourist accommodation on the island, it has a reasonable pebble beach backed by cliffs, and a few of the usual bars and tavernas. Hotels on the waterfront can be a little more expensive than the average, those on top of the cliff are a little cheaper and have some very good views of the bay below. Pine resin is still collected on Alonissos and is used to give the Greek Retsina wine it's unique flavour. It is also said to make quite a reasonable furniture polish. A long narrow island, the northernmost which is serviced by Skiathos airport, Alonissos offers even more seclusion and peace than Skopelos. It is the perfect island for nature-lovers and those who are seeking the delights of a simple Greek island. The main town, Patitiri, is an essentially sleepy harbour-side settlement with cafes and tavernas which overlook the comings and goings of the ferries and fishing boats. Entering into this naturally protected harbour, ones 1st impression are the steep, stone and clay cliffs which are intermingled with deep green pine trees providing a striking contrast as they cascade down to the clear emerald waters below. The town took its name from the original wine presses (patatiria) that made up the working waterfront in the days when Alonissos was a significant wine producing island. The harbour today is more functional than beautiful with plenty of restaurants, shopping and a limited nightlife. Alonissos beaches give the visitor a wide variety to choose from and its waters are considered to be some of the cleanest in the entire Mediterranean. Spend a day of swimming and sunning , then sit at a seaside taverna for lunch or alternatively, take a picnic lunch to a newly discovered secluded cove. Private motor boat hire is especially good on Alonissos due to the protection from wind and weather that the adjacent island of Peristera gives to the southern coastline, which is dotted with plentiful coves and small beaches. The newly opened Alonissos Diving School gives a rare opportunity to explore the undersea world of this area which boasts astounding beauty, a sunken city and ancient shipwrecks. Due to the its intricate coastline of small caves and coves as well as the many rocky islets, over time the islands surrounding Alonissos became a last haven for the shy and endangered species of seal, Monachus, Monachus or more commonly known as the Monk seal. In 1992, a National Marine Park was established in Alonissos and the surrounding area known as the "deserted islands". An added benefit of the park was its protection of other endangered species of goats, birds, reptiles and fish which are rich in their abundance and variety. Special tours are organized to the "deserted islands" area of the Marine Park where playful schools of dolphins are a common sight, but only the lucky, just might catch sight of the rare little seal that inhabits the area. Best Price Guarantee - We always offer you our lowest available Hellenic Seaways passenger and car ferries ticket price to and from Alonissos. There are no hidden extras or surprises such as added fuel surcharges or booking fees and we also we do not charge you anything extra for paying with a Visa Electron card. The price we quote for your selected Alonissos ferry ticket, onboard accommodation and vehicle type is all you will pay, and that's a promise! In the unlikely event you find the same all inclusive Alonissos ferry ticket cheaper in the brochure of any other tour operator we promise that we will do our best to beat that price or offer you the choice of requesting a refund. 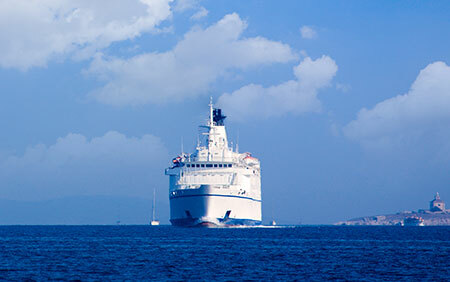 To book Alonissos car and passenger ferry tickets please click here. At ferryto.co.uk you are able to obtain live Alonissos ferry ticket prices, check availability and book car and passenger ferry tickets to and from Alonissos at our lowest available ticket price. Ferryto.co.uk is part of the world's largest online ferry ticket distribution network providing the ability to book over 80 major European ferry operators including to Alonissos and to over 1,200 other ferry routes throughout the UK, France, Spain, Ireland, Holland, Eastern Europe, the Mediterranean, the Baltic and North Africa.